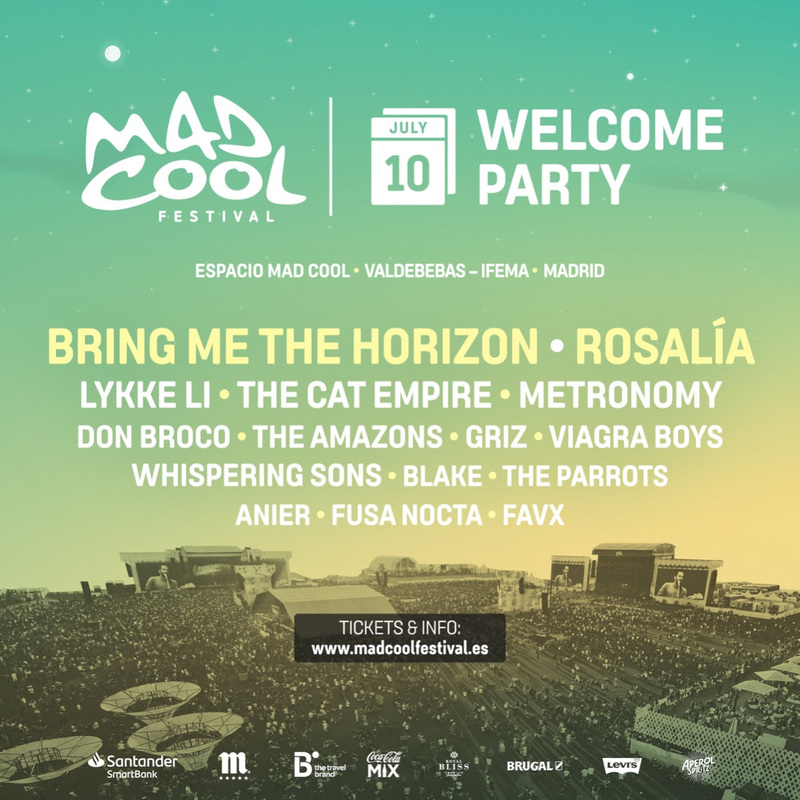 Rosalía and Bring Me The Horizon open the line-up for the 2019 Mad Cool Welcome Party, this inaugural session is to celebrate the beginning of the fourth Mad Cool Festival Edition and for the first time, the welcome party will take place at the same venue as the festival, El recinto Valdebebas. But with a limited capacity to keep things really cool. Mad Cool. It will be a special day, green lighting the three-day festival but the Welcome Party will have its own eclectic and spectacular line up, integrating 16 bands varying between indie pop, hard rock, flamenco, trap, and post-punk. Headlining the day will be Rosalía and Bring Me The Horizon, there will also be unmissable performances from Lykke Li, Metronomy, Viagra Boys and more! In previous editions, the opening party was held in Madrid’s city centre, but now Mad Cool 2019 will open at the festival site itself, in Valdebebas. The line-up for the WELCOME PARTY will be divided into 4 different stages and artists will perform to a limited capacity of just 50,000 people. This extra day means the fans who are able to secure one of the limited number of tickets for Wednesday 10th July can enjoy the Mad Cool Festivalexperience in the special space, getting the most out of the facilities, without the crowds of the festival proper, as a unique and one-off event. Friday April 19th at 12pm. Ticket sales for general public. Everyone that holds a three-day ticket for the festival: 30€*. Available at Madcoolfestival.es, Ticketmaster and Festicket. General Public: 35€*. Available at Madcoolfestival.es, Ticketmaster and Festicket. Everyone that already has their VIP Mad Cool Festival ticket will be able to access the Welcome Party on Wednesday with their wristband. Anyone who purchased the special promotion Mad Cool Lovers will receive their Welcome Party ticket via email. As potentially one of the biggest Latino artists in the world Rosalía has had a world-shaking year and seemingly shattered international boundaries and preconceptions with her extraordinary voice that combines both flamenco with pop. Artist, song writer and producer, with a unique talent, her album El Mal Querer (2018) has broken every possible record: two Grammy Latino Awards, credits on every end of year list (from Mondo Sonoro to New York Times, Pitchfork, Noisey, etc. ), Number #1 record sales and streaming figures that all mean after her spectacular 2018, Mad Cool are proud to announce Rosalía as headline artist for the Mad Cool 2019 Welcome Party. We look forward to seeing you at MAD COOL 2019!